What a game. Not since 1986 have we seen a team used 3 fieldgoals to win a game. But it was a necessary as the boys came back from 2-10 down in the final quarter. The way the team fought back to lead by a point, only lose it from a dubious penalty, the draw level 12 all and then seal it 13-12. The execution by the team and Reynolds in kicking those field goals was superb. It was a great performance as the boys picked themselves up from the heart-breaking one point loss to storm home. Now for our last ever clash at teh Sydney Football Stadium against our combatants of 110 years. Adam Reynolds was the man of the moment scoring all 13 points in the match.His try took him to 200 points for the season, the 4th time he has achieved this in his career, equalling the great Eric Simms who has also scoed 200 points 4 times in his career. 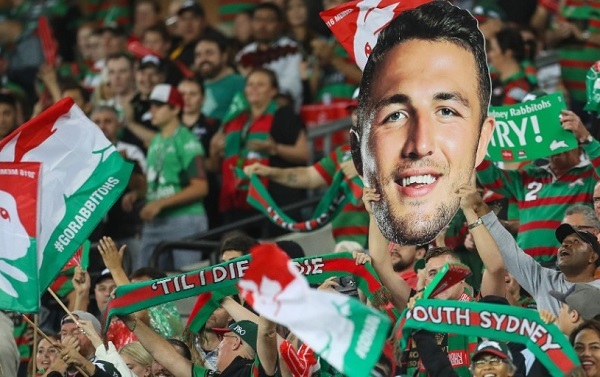 Its been a media frenzy all week between the original concerns trying to implicate Sam Burgess. This has taken a lot of focus away from our 2nd biggest game of the year. It looked like it caused some on field drop in performance early in the game. One thing it has done this week however is caused the team to batten down the hatches, and the team seems to be a lot more focused than they were late last week. For injured player Zane Musgrove his appearance in court over a broken gate acted as a media distraction, that at least didn't involve the core team. This weekend ends the era of the Sydney Football Stadium. The stadium was modeled on a old mid 1960s Olympic Stadium design, but very quickly fans realised that the roof while looking great offered almost no shelter from the elements. After this weekends game, demolition works will get undeway as NRL games get shifted away for 2 years during construction of the new stadium. It will interesting to see what incentives the SCG Trust offer Souths to play matches at the new venue. Statistically it was a poor game Completion dropped to 71% from 81% last week. Errors dropped to 10 from 7 last week. We gave away 8 penalties compared to 6 last week. Souths Effective 1st tackle dropped to a average level of 30.5m from 28.3m last week. Our missed tackles improved but still at a very poor level of 34 missed tackles from 36 last week. Opposition offloads were steady at 6 again this week. Looking at our left side defence - Jennings-Inglis-Walker-Sutton (0-2-2-5) was dropped to 9 from 2 missed tackles last week. On the right side Graham-Gagai-Reynolds-Crichton (1-2-5-4) was improved to 12 from 18 missed tackles last week week. Ruck defence TBurgess/Britt-Cook-GBurgess/Clark-SBurgess/Murray (3-4-2-4) was dropped to 13 from 12 missed tackles last week. Our go forward improved to 1889m from 1520m last week. Cook, Tom Burgess, George Burgess, Murray, Britt, Alex Johnston, Jennings, Gagai and Graham made 10+m per run. Murray, Tom Burgess, Cook, Sam Burgess, Sutton, George Burgess, Crichton, Gagai, Alex Johnston, Jennings, Inglis and Walker making 100+m in the match. Defensively Cook was our best in the tackling raking up 42 tackles. Murray, Britt, Jennings and Alex Johnston didn't miss a tackle.